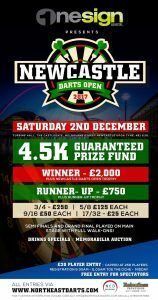 The One Sign & Digital Newcastle Darts Open 2017 is 6 weeks away. Spaces are filling up fast and we are expecting to hit the capped 256. Enter yourself today by clicking HERE. PLEASE NOTE: Payment via debit/credit card will not be available until 1PM on Wednesday 24th May. All entries made on Monday 22nd May and Tuesday 23rd May will only be confirmed once the entry fee has been direct transferred to the account details given.